Conrad Tokyo oteline istediğiniz tarihleri içeren bir müsaitlik talebi gönderin. Relax in this City Room with one king-sized bed. Take in panoramic views of the dynamic skyscrapers of Ginza and Shiodome and enjoy a stylish bathroom with freestanding bath, a duo of white marble basins, and light-rimmed circular mirror. Relax in this City Room with twin beds and take in panoramic views of the dynamic skyscrapers of Ginza and Shiodome. Unwind in the stylish bathroom, separated by a glass partition, which features a luxurious freestanding bath, duo of white marble basins, and a light-rimmed circular mirror. Relax in this Bay View Room with one king-sized bed and take in panoramic views overlooking the Royal Hamarikyu Gardens and Tokyo Bay. Unwind in the stylish bathroom, separated by a glass partition, which features a freestanding bath, a duo of white marble basins, and light-rimmed circular mirror. 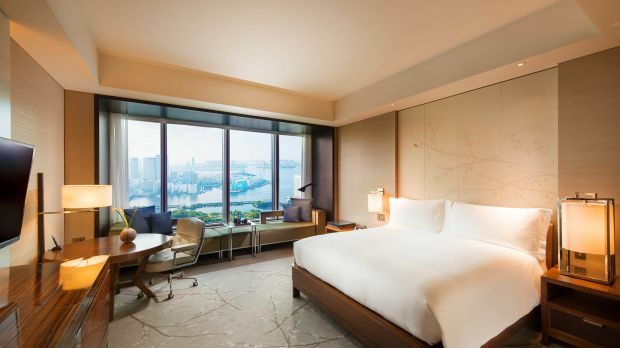 Relax in this Bay View Room with twin beds and take in panoramic views overlooking the Royal Hamarikyu Gardens and Tokyo Bay. Unwind in the stylish bathroom, separated by a glass partition, which features a freestanding bath, a duo of white marble basins, and light-rimmed circular mirror. Located on floors 30-35. Stay in style in this Executive Level guest room with one king-sized bed. 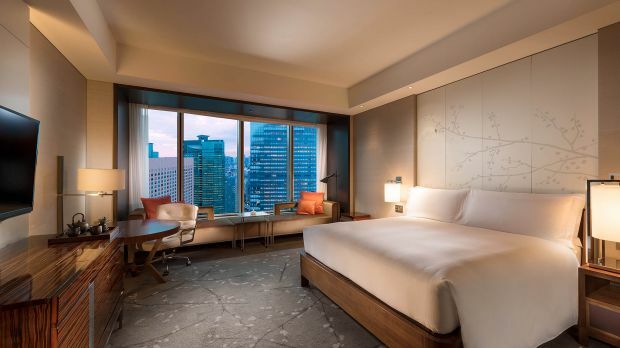 The room offers stunning Japanese inspired décor and panoramic views overlooking the skyscrapers of Ginza and Shiodome. Stay in style in this Executive Level guest room with twin beds. 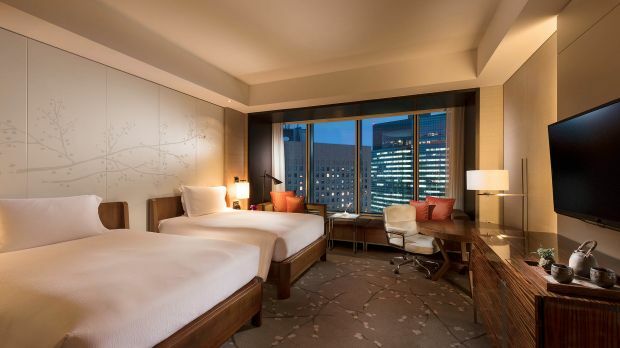 The room offers stunning Japanese inspired décor and panoramic views overlooking the skyscrapers of Ginza and Shiodome. Stay in style in this City Suite with twin beds. 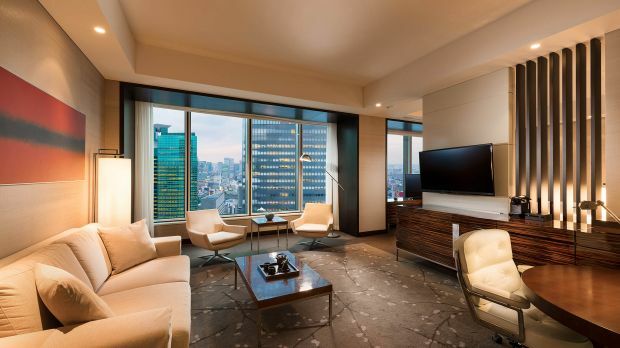 The suite offers stunning Japanese inspired décor and panoramic views overlooking the skyscrapers of Ginza and Shiodome. Enjoy extra space with a separate living room, bedroom and walk-in wardrobe. The spacious Corner Suite offers contemporary luxury. Enjoy panoramic views over the dynamic skyscrapers of Ginza and Shiodome. This suite features modern Japanese-inspired decor in a separate living room. The bedroom has a walk-in wardrobe. 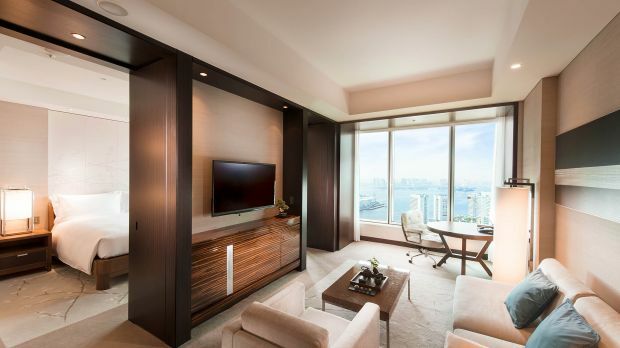 Stay in style in this Bay View Suite with one king-sized bed. 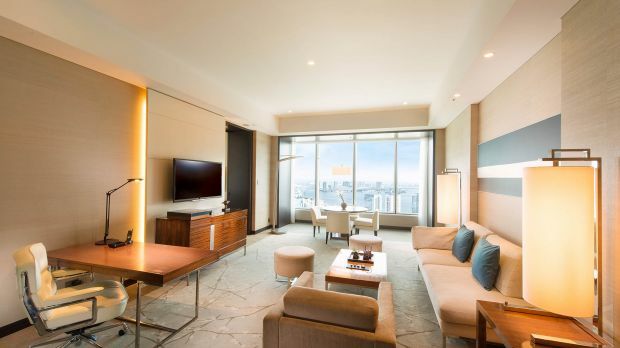 The suite offers stunning Japanese inspired décor and panoramic views overlooking the Royal Hamarikyu Gardens and Tokyo Bay. Enjoy extra space with a separate living room, bedroom and walk-in wardrobe. Stay in style in this Bay View Suite with twin beds. 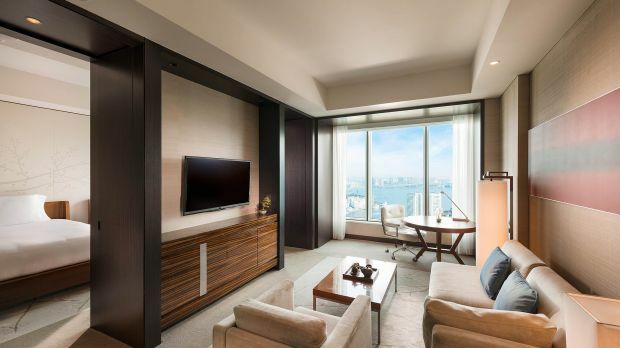 The suite offers stunning Japanese inspired décor and panoramic views overlooking the skyscrapers of Ginza and Shiodome. Enjoy extra space with a separate living room, bedroom and walk-in wardrobe. Stay in style in this Executive Level guest room with one king-sized bed. 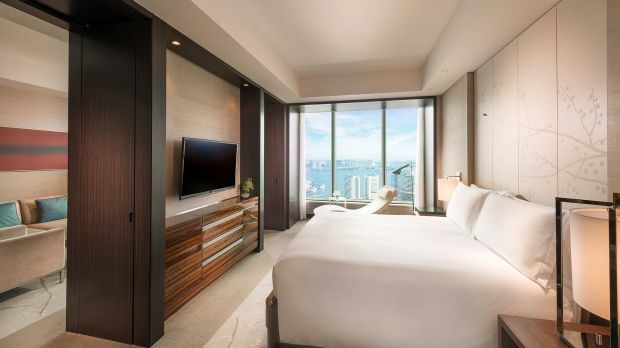 The room offers stunning Japanese inspired décor and panoramic views overlooking the Royal Hamarikyu Gardens and Tokyo Bay. Stay in style in this Executive Level guest room with twin beds. 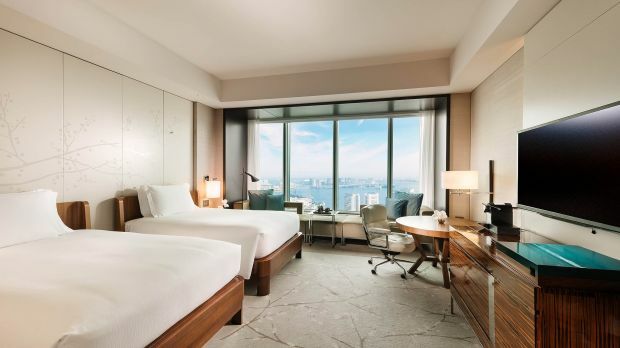 The room offers stunning Japanese inspired décor and panoramic views overlooking the Royal Hamarikyu Gardens and Tokyo Bay. 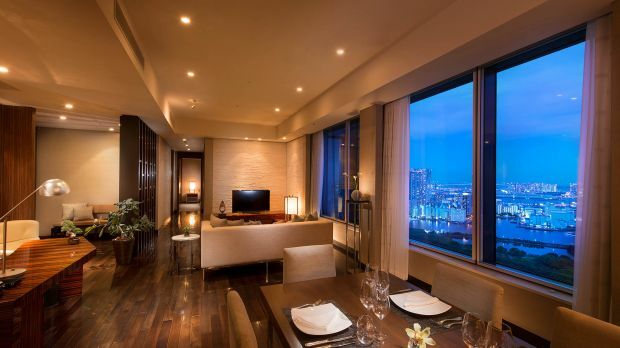 Features 1 King bed, contemporary design, large living room and panoramic Tokyo bay view. 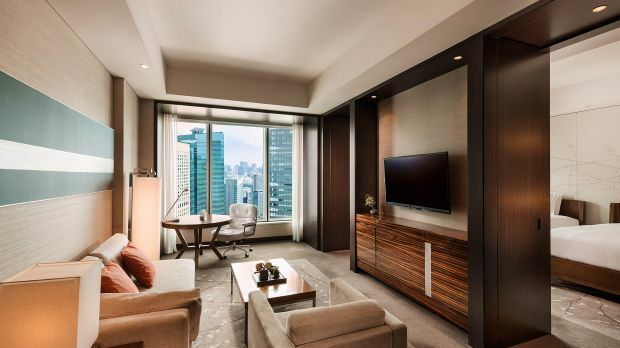 Upgrade to this Executive City Suite with twin beds. 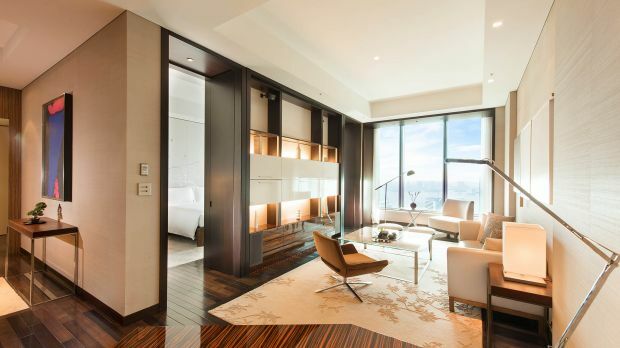 The suite offers stunning Japanese inspired décor and panoramic views overlooking the skyscrapers of Ginza and Shiodome. Enjoy extra space with a separate living room, bedroom and walk-in wardrobe. Suite with 1 King bed, exclusive access to the Club Lounge, complimentary breakfast and Wi-Fi and a view of the bay. Upgrade to this Executive Level Suite with twin beds. The suite offers stunning Japanese inspired décor and panoramic views overlooking the Royal Hamarikyu Gardens and Tokyo Bay. Enjoy extra space with a separate living room, bedroom and walk-in wardrobe. 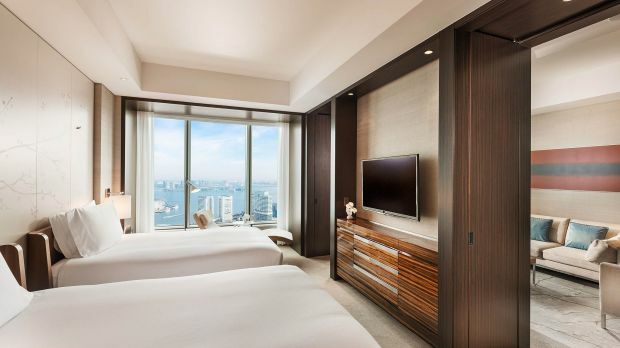 Stay in style in this Deluxe Suite, offering one king-sized bed and stunning views overlooking the Royal Hamarikyu Gardens and Tokyo Bay. This spacious suite boasts a separate bedroom and dressing room, as well as a living room and dining area. Features two bedrooms with king beds, living room, two bathrooms, kitchen, dining area, laundry area, and bay view. 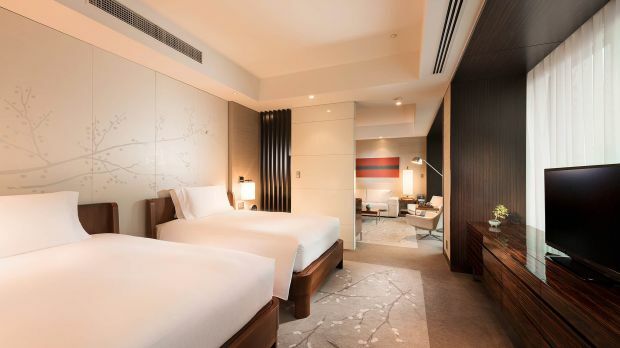 Stay in the luxurious Royal Hamarikyu Suite, complete with Japanese inspired décor and stunning top-floor views over the Royal Hamarikyu Gardens and Tokyo Bay. The suite offers two bedrooms with king and twin beds, as well as two bathrooms, a guest washroom, dining area and dressing room.